Rupert Pupkin Speaks: My Warner Archive Grab Bag: Lee Tracy Twofer - TURN BACK THE CLOCK and THE NUISANCE ""
This is a bit of an uncharacteristic Lee Tracy movie. He's much more James Stewart-y here as a guy named Joe Gimlet. Not really the fast-talking a smart aleck we're used to seeing. Much more sincere and earnest. Two old friends happen upon each other after many years and decide to have dinner. One of the two(Lee Tracy) owns a small tobacco shop and is just getting by financially and the other(Otto Kruger) has become wealthy and is to the girl that the tobacconist had a chance to marry years ago. After a nice night of reminiscing, things end on a slightly regretful sour note and Joe goes for a walk and is hit by a car. When he comes to, he finds himself 20 years in the past and with an opportunity to change the path of his life(for what he thinks will be the better). The movie is kind of an IT'S A WONDERFUL LIFE scenario. Of course, TURN BACK THE CLOCK is no IT'S A WONDERFUL LIFE, but it's well done and Ben Hecht was one of the writers so that gives it a nice boost. I am a sucker for these Twilight Zone-type scenarios so I liked it of course. Feels like perhaps Bob Zemeckis and Bob Gale might have looked at it before BACK TO THE FUTURE(or maybe it was even part of the germ of the idea for that movie). At one point, Lee Tracy even talks to a Doctor friend of his and says "You've gotta get me back! "<in time>. Lee Tracy is interesting in this role. He has this sympathetic Jimmy Stewart by way of W.C. Fields manner about him. There's this certain air of desperation about him that he pulls of quite well. Overall, as much as the film has a very Capra-esque feeling, somehow the story itself and Tracy's performance bring to it a certain noir-ish fatalism almost. 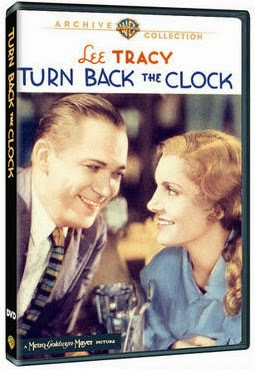 Like TURN BACK THE CLOCK, this film is also making its debut on DVD which is very exciting for Lee Tracy fans like me. THE NUISANCE is, with BLESSED EVENT, one of my favorite Lee Tracy films. In THE NUISANCE, Tracy plays a literal ambulance chasing lawyer named Joe Stevens (Tracy seemed to fit the name Joe pretty well I guess). He goes by J. Phineas Stevens for the most part in an effort to make himself sound more fancy. He's as sleazy and slippery as they come -- even has a 'crew' consisting of a doctor who can alter x-rays (Frank Morgan) and a team of 'witnesses' as well as an assistant who has found a talent for stumbling in front of cars to stage accidents. Joe has set up a nice little racket for himself. He knows every angle and has found a way to exploit them all. But as is often the case with slick characters like this, J. Phineas Stevens finally meets his match in a lovely gal he comes across at the scene of an accident (Madge Evans). Once his affection obsession with her takes hold, he begins to lose his edge and his situation gets turned on its head. THE NUISANCE truly exemplifies why Lee Tracy is remembered as one of the greatest 'fast-talkers' of Hollywood's Golden Era. He chews through dialogue like a lawnmower, leaving shreds of syllables flying here and there. He's great as Jean Harlow's greasy publicist in BOMBSHELL, but he couldn't be more well-suited for a role than he is here. For the Lee Tracy uninitiated, this might be a great place to start. One thing I love about the movie is that as cynical as it is on a lot of ways, it also has a streak of romance running through it that I found quite heartwarming.